← Beware the Montreal Squirrels! So it was with that same pleasant sense of expectation that I dragged down and opened a jar of roasted pickled peppers yesterday. I’d visited the farmer’s market in Peacedale earlier, and picked up a stick of Fortuna’s excellent “Soupy.” (For non-Rhode Islanders, “Soupy” is the nickname given to soppresata, an Italian dry-cured sausage. Fortuna’s in Charlestown, RI, makes an awesome one.) I was already thinking pizza, with homemade tomato sauce, the soupy, and oh, yeah, maybe some of those pickled peppers I put up this fall. I no sooner opened the jar than I knew I had something special on my hands. I’d roasted my bumper crop of red sweet peppers on the grill, and got that earthy sweet roasted pepper smell immediately, followed by the mellow notes of garlic and cider vinegar. Mmmm… I have to tell you, they were amazing. I had to stop myself from grabbing a fork and eating the whole jar right then and there. I got the recipe from Linda Ziedrich’s cookbook, The Joy of Pickling. It’s pretty basic. I think the key is grilling the peppers to roast them. In a nonreactive saucepan, bring to a boil the vinegar, sugar, salt, and garlic. Reduce the heat, and simmer the liquid, covered, for 10 minutes. 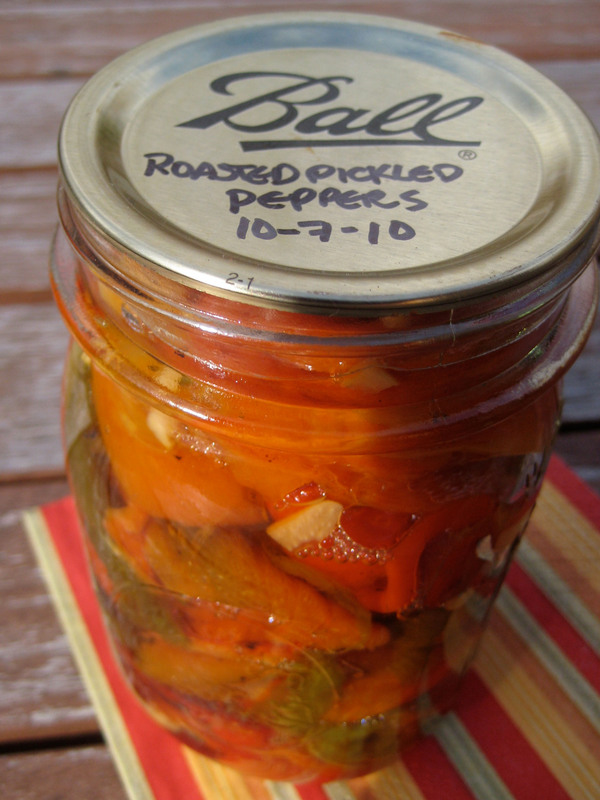 Pack the peppers into pint or half-pint jars. Pour the hot liquid over the peppers, leaving 1/2 inch headspace. Probe the jars carefully with a wooden skewer or chopstick to release all the air bubbles. Close the jars with hot two-piece caps, and process the jars for 10 minutes in a boiling-water bath. Store the cooled jars in a cool, dry, dark place for at least 3 weeks before eating the peppers.